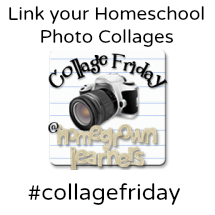 *You have arrived at Collage Friday - the format is just a bit different this week! Link up is at the end of this post. There has been much excitement in our house this week. God is working and present in the events of the week. I have NO doubt. It all started last weekend, as my husband and I attended Blogging Concentrated. Dan Morris and Crystal Collins led a day of learning that greatly benefited my husband and me. It was also much fun to spend the day with my dear friend, Tricia (you know here as Hodgepodge Mom) and her husband. Tricia is one smart homeschooling mom with beautiful art tutorials and other goodness on Southern Hodgepodge. I never imagined, when my husband first encouraged me to start a blog, that it would blossom into so much more. 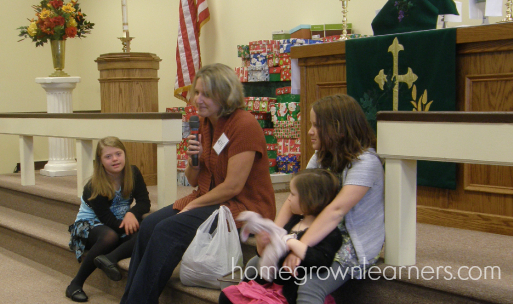 God placed it on my heart to share our homeschool journey, and through that sharing I have had my eyes opened to so many wonderful opportunities and blessings. One of my biggest prayers has been for God to use my blog for His glory. I invest so much time and energy into this little corner of the world, and I just want it to be WORTH IT - for something bigger. That prayer was answered in a phone call I received Saturday from Jimmie, while we were driving home from Blogging Concentrated. Little did I know that Jimmie was a messenger from Operation Christmas Child! I am going to Ecuador in December (the 15th to be exact) to pass out shoe boxes!! It has consumed my thoughts this week, and I am thrilled for this opportunity! Last year at this time, I blogged about OCC and my sweet little Grant's words as we were shopping for shoe box items. He had picked out New Testaments for the boxes, along with some teddy bears. He told me it was so they could "know Jesus like I do." We packed boxes and filled the very last one from our church in a Children's Sermon I did -- you never can envision where your boxes will go, or which children's lives they will touch. Now I will get to hug these precious children and share the Jesus I know. I'm overwhelmed and humbled by this mission. Would you begin praying for me as I prepare for this journey? Several "God things" have happened since I found out about the trip to Ecuador. Anna is studying South America this week (scheduled long ago in the Challenge curriculum). She was the authority on Ecuador! Monday, a letter from Operation Christmas Child arrived - it said, "Good News, Great Joy" - no small coincidence. Tuesday, I sat down at Classical Conversations to eat lunch. I had some anxiety about flying to the highest capital city in the world (Quito, Ecuador) and I had heard some scary things about the airport there. Lo and behold, one of the CC dads is a pilot, and he routinely flies to Ecuador. He alleviated all of my fears. Our CC community needed a service project this semester - the director is allowing me to organize a box packing party in just a few weeks! A friend of mine (whose mission board we served on 10 years ago) sent me a note telling me what an impact OCC boxes had on her own children - they were living in Romania as house parents in an orphanage at the time, and her children treasured their OCC boxes! Ami wrote to me to say the little girl they are waiting to adopt is in an orphanage near Quito, and perhaps she will be one of the recipients of a shoe box. The government shutdown ended - so now there isn't a fear of my passport being delayed! Do you see, friends? SEVEN big things happened this week that confirm to me this is where GOD wants me to be in December! Yes, we accomplished much in our homeschool this week. We learned all about Ecuador, we applied for a passport, and we watched so many Operation Christmas Child videos. I know we did Latin, math, read alouds, geography, and more. Truth be told, I wasn't as concerned about those "other subjects" this week. So for now - please pray for all those involved in service to Operation Christmas Child, and I will provide you with more details about my trip as the time approaches! Have you packed any shoe boxes yet? I am very thankful for this Collage Friday community. I learn so much from each of your blogs - Friday is my favorite blogging day of the week!